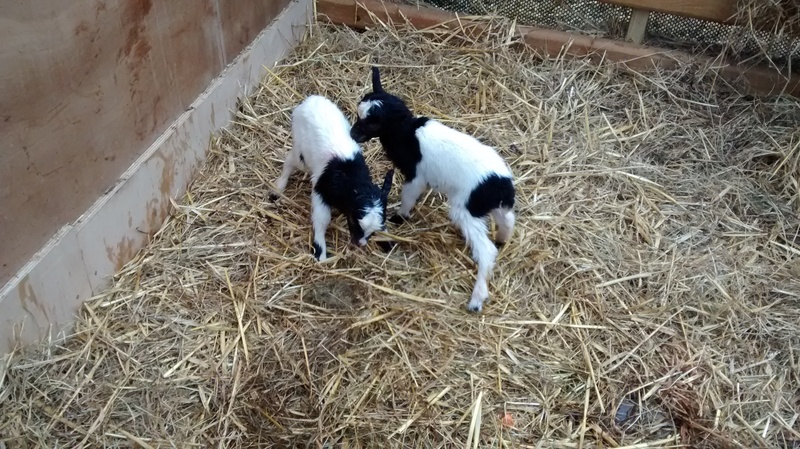 Nettle Country Cottage welcomes two new Bagots goats Urban and Nettle to join their collection of other animals. Alonzo, from the Cwmffrwd Villa herd, has taken to jumping over the fence whenever he sees anyone at the window, he then trots round and into the house. Becky Sheppard took this photo as he left the kitchen. Animals from around Norfolk have donated their fur, fleece and feathers to create a four metre long ‘Wall of Wool’ in the crypt of Norwich School. Hair from rabbits, guinea pigs, alpacas, llamas, camels, horses and of course sheep all helped to build the ‘Wall of Wool’ as part of the Association of Guilds of Weavers, Spinners and Dyers’ National Exhibition 2014 ‘Yarns in the Cathedral’. 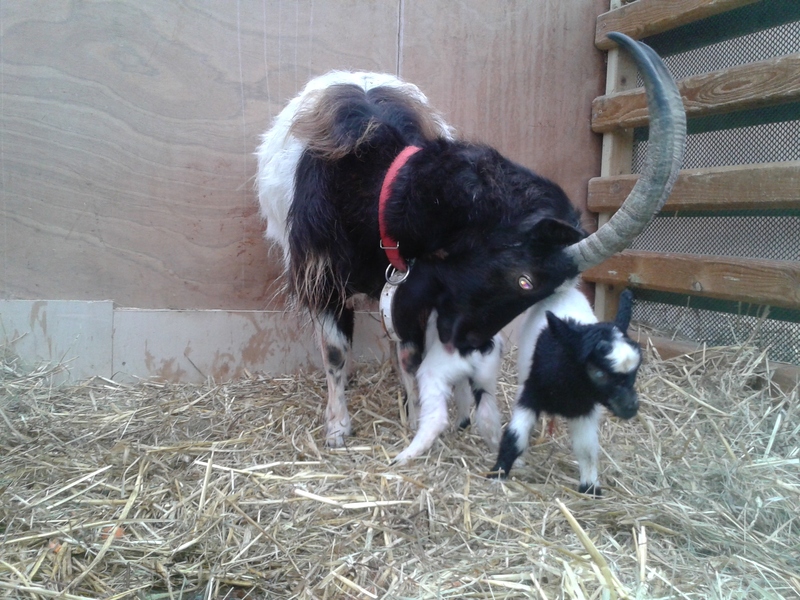 Bagot goats are not the only British rare breed to feature in the ‘Wall of Wool’, they are joined by Golden Guernsey goat, Suffolk Punch Horse and various breeds of sheep such as Balwen, Hebridean, Norfolk Horn, Portland, Shetland and Whitefaced Woodland, to name a few. The Bagot hair featuring in the wall comes from two billies, one from the Meadowside herd and the other from the Hadleigh Farm Park herd. 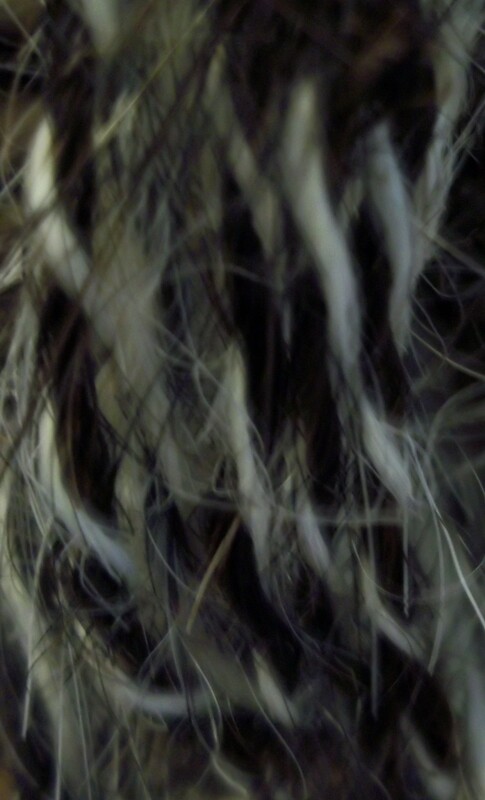 The Meadowside billy’s hair had naturally felted before it was shed and was therefore intertwined with fleece from a Greyfaced Dartmoor sheep to form an art yarn. 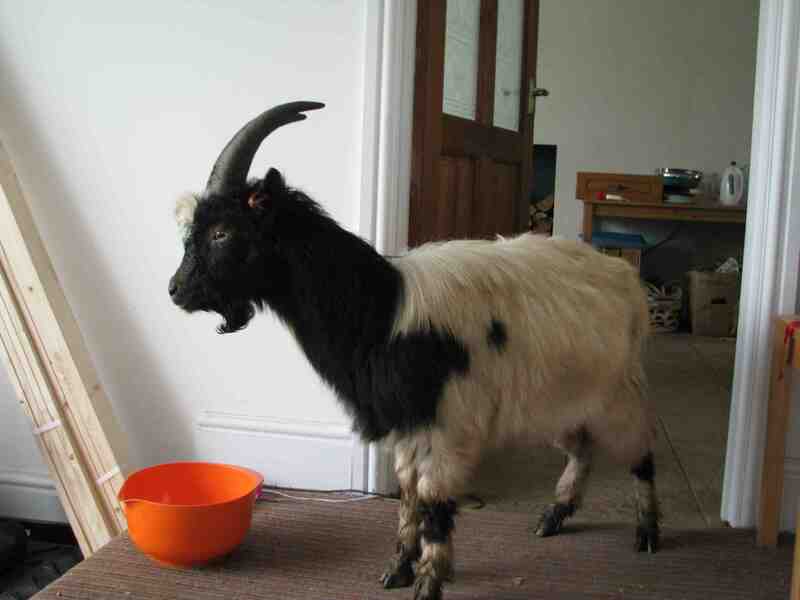 The Hadleigh billy’s hair was in much better condition for spinning and has been created into an exclusive Bagot yarn. As you can imagine, the spun Bagot hair has a coarse feel to it, it is strong and feels more like string than wool. The hair has been taken from the billies’ naturally long coats, the nannies have much shorter coats than the billies and rarely have any surplus hair to donate to a project such as this! Bagots need their hair to keep warm during the winter and naturally shed small amounts throughout the year so it is unlikely that we will see a trend for coarse, stringy Bagot hair products in the near future! The exhibition is currently being held at Norwich Cathedral until Sunday 1st June 2014, see http://www.wsd.org.uk/ex.htm for opening times and more details. It is with deep regret that the Bagot Goat Society have to record the death of their Honorary President, Lady Nancy Bagot, who passed away at the end of February 2014. Lady Nancy Bagot will be remembered in a memorial service on 26th April 2014. BG Alice at Cotswold Farm Park. 14 years old and still kidding. 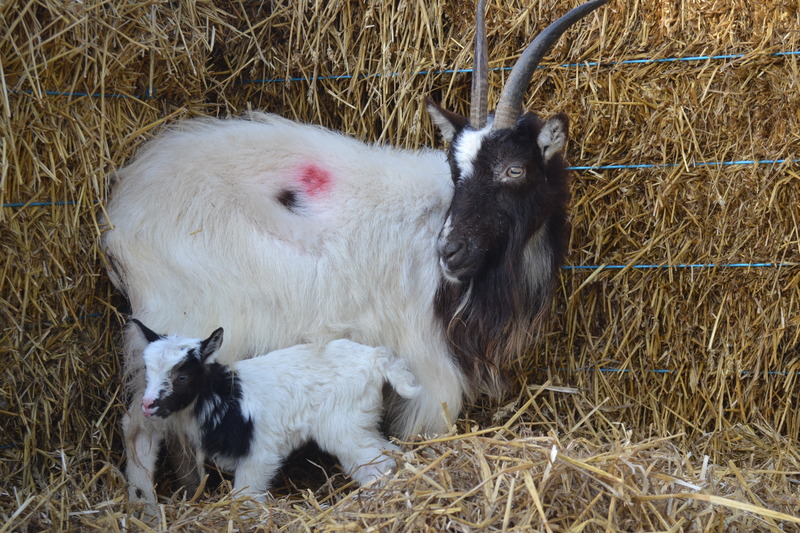 Alice the Bagot goat, one of the Cotswold Farm Park’s oldest residents caused a double celebration last week. On Tuesday 25th February 2014 she gave birth to a happy and healthy female kid, and then, only three days later Alice had her 14th birthday. 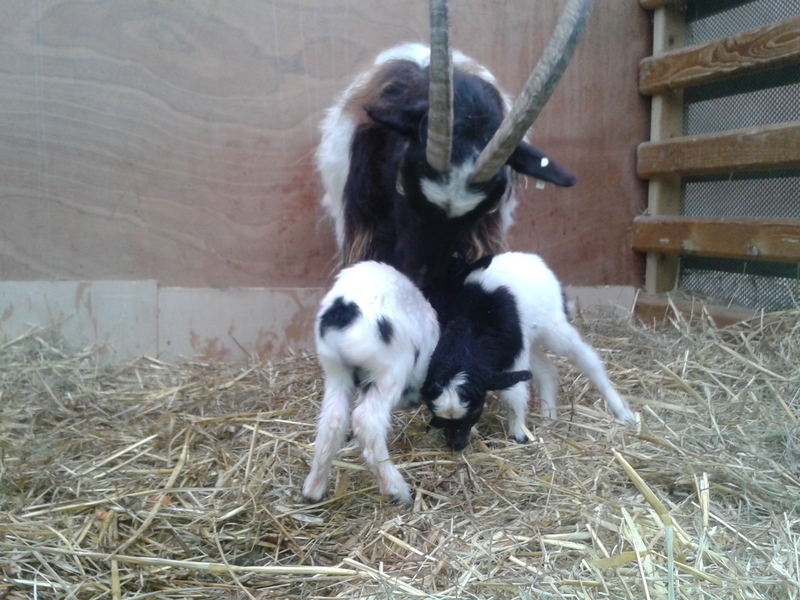 Alice lives in a herd of 15 Bagot goats at Cotswold Farm Park, and her new addition is one of 12 expected goat kids at the park this year. This is Alice’s fifth daughter.